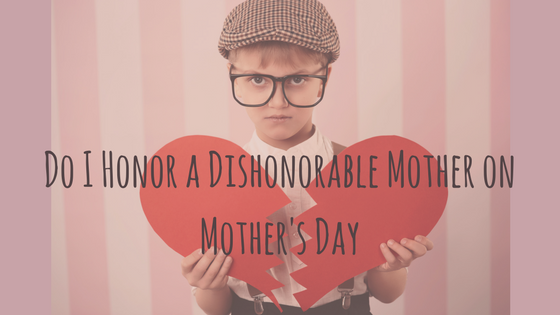 Do I Honor a Dishonorable Mother on Mother’s Day? Might sound harsh, but not all mothers need to be honored on Mother’s Day. Many of the clients I work with have had mothers that were emotionally neglectful or abusive. Often times, the manipulation and mind games don’t get easier into adulthood, especially if you’ve continued to have a relationship with mom either out of need (she does babysit after all) or out of fear (my family will judge or disown me), or out of guilt (she is my MOM). I’m writing this post to give you permission to change this unhealthy dynamic. Sometimes you might say to yourself “mom my did the best she could” but as you look into your child’s eye (or any child for that matter), you also know that you couldn’t imagine treating your little one the way your mother treated you. You know that no matter what you do, your mother will never be satisfied and mitigate your accomplishments. If something horrible happened to you, it was obviously your fault for allowing it to happen…. The only time you hear praise from your mother is when she brags about you to her friends and usually shares the “sacrifices” she made that resulted in your accomplishments. Everyone thinks your mom is great (she is about image after all). But you know her true colors. The lack of love and support, the judgement and blame, the chronic feelings of being not seen and unimportant. You can’t tell anyone either – no one would believe you. Particularly for my clients that fall into this or like categories, holiday’s can be stressful, especially Mother’s Day. You don’t feel mom deserves anything, and you know whatever you do won’t be good enough anyways. You could just not celebrate and spend time with your own family (if you have one or alone or with your friends if you don’t have one), but that would be seen as selfish and everyone will think I’m a horrible person. It’s a pretty tough space to be in. Working through the deep issues takes a lot of work in therapy and can be a real tough road, but my clients do find that not just the every day stress, but days like Mother’s Day can becomes manageable and maybe even enjoyable! If you’re not there yet, I’ll offer some tips that might be helpful in the meantime, but I invite you to consider doing the work to heal these emotional wounds, because they are not healed by time. 1. Do only what feels authentic to you – OK. I know I’m hitting you with a tough one off the bat. If you want to see mom face to face, what is the time limit or cap you can put on that time? If you don’t want to see her but want to send a card or gift – do that. Can’t find a card that fits? Write it yourself and focus on what you do like about mom (but don’t be passive aggressive). If you don’t want to see mom, then don’t. – OK so it likely takes a lot of therapy to get to this point, so if you’re not there yet, know this is possible. 3. Don’t give way to inquiring minds – Other family members or people who talk to mom might push mom’s agenda on you with the guilt or serve as middle man to pass information on if mom is upset by the boundaries you set. It’s important to set firm boundaries, “Since the issue involves mom and I, I will only talk about it with her and not anyone else.” “I understand it doesn’t make sense to you based on the information you have, but ask that you don’t place judgements on me for doing what it best for me and my health.” Again, these boundaries are hard to set and often require a lot of work. These tips, I understand, are likely difficult to do without the right support systems in place, but if you are at this place in your journey, they might hit the spot for you. If you’re not there yet, then I invite you to know with internal work in therapy, you CAN get there and don’t have to be stuck forever. But don’t get down on yourself if you’re feeling trapped in your situation. On this Mother’s Day I offer you support and that I understand the situation is difficult to navigate and hope that one day it gets better for you.